• It can be difficult to diagnose allergies because symptoms often vary dramatically or are similar to other conditions. • Keeping a diary of symptoms and looking for patterns can help your pediatrician make a diagnosis. • Allergies are not curable, but you can help your child relieve symptoms and avoid the allergen. Allergies are difficult to diagnose because the type and severity of the symptoms vary dramatically depending on the person and the type of allergen. Here are some common allergies and their symptoms. If you think your child has an allergy, watch to see if you can identify a pattern of symptoms that occur when your child is exposed to certain allergens. Keeping a diary of symptoms and potential allergens can be very helpful in identifying an allergy. It is especially useful when symptoms are similar to other conditions, like the common cold. Be suspicious if your child has cold-like symptoms that last more than two weeks or that show up at the same time each year. If you suspect your child has an allergy, consult with your pediatrician. During your visit with the doctor, your doctor will examine your child and ask about any symptoms. Your doctor will then make a diagnosis and prescribe any needed medications or refer you to an allergist. An allergist will typically perform skin tests for the most common allergens. 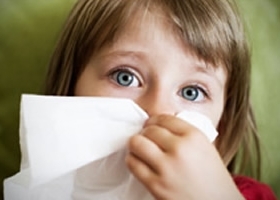 You can’t cure allergies, but you can help your child relieve their symptoms and avoid the allergen. • Teach your child about the allergy and its reactions. Make sure teachers, family members, and anybody who has contact with your child is aware of the allergy. • Avoid the use of carpets, rugs, or heavy drapes in your child’s room. Remove any items that allow dust to accumulate. The good news is that with proper treatment and prevention, allergies don’t have to interfere with your child living a happy and healthy life.